I haven’t been to many wildlife parks in Kenya so I can’t really compare, but I loved Masai Mara National Reserve when I was there. Our group of Americans stayed in Siana Lodge just outside the reserve. We stayed in large, luxury 2-person tents. It had a toilet, shower, electricity and very good beds. We were received with drinks, very friendly. We were covered with dust from the bad roads – even though the windows of our van were closed, there still was dust everywhere. After a very good dinner there was a surprise dance by traditional Masai warriors. It was very impressive. Still, it was clear it was a typical tourist thing. Next morning the staff woke us up at 6… since the Jeeps were leaving for a game drive through Masai Mara at 6.30. Aarhgh. It was still dark. We left after a cup of tea. Sunrise was beautiful, it was clear it would be a hot day. It was totally silent in the park. It was the dry season, so many animals had moved to the big lakes in Tanzania. We really had to look for them. We didn’t see large groups of animals, but still the diversity was large and we say many of them. Right at the beginning of our game drive, we were very lucky to see TWO cheetahs. They are very rarely seen. They were stalking through the high grass, right in front of our Jeep. But they didn’t seem to like our presence so we left them alone. Lions were present much more. We spotted a whole group under a tree. One of the lionesses had 3 cubs. Apparently they were used to tourists. We were only 20 feet away. It was extremely impressive to see these dangerous and unpredictable animals so up close. 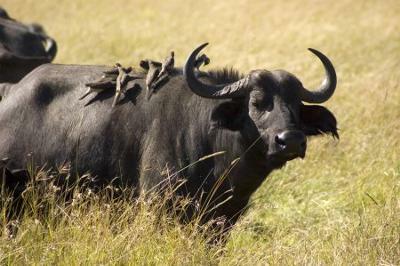 Then I’m not even mentioning the buffaloes… We saw a whole herd of them. We drove closer and closer. Then the herd was closing in on us. They were left, right and behind them. Our driver turned off the engine and there was total silence. Then one of the buffaloes came in front of us, bowing his head, scraping his claw over the ground and blowing out steam. It was scary! Our driver quickly turned on the engine and drove backwards fast. My heart was beating out loud! Later we went back to Siana again where I could show off my pictures to those that stayed there. They were especially impressed by the cheetahs! Hi Laura, thanks for your posting your story here. You've been lucky to see two cheetahs at once! They're beautiful animals, one of my favorites. Join in and write your own page! It's easy to do. How? Simply click here to return to Kenya National Parks.